Seeking sound patterns in French and exploring a poem about days of the week and colours. 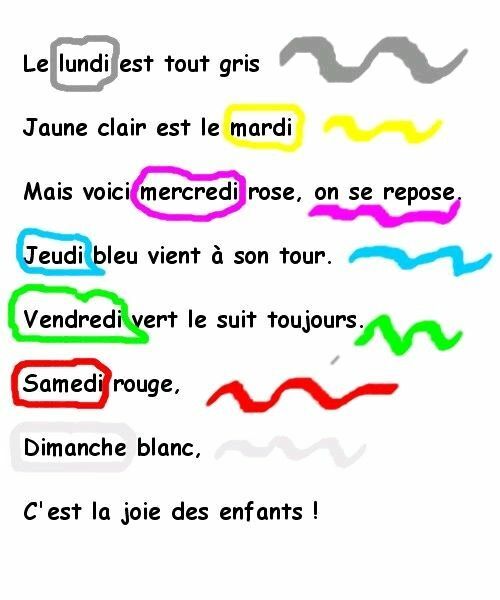 By concealing any other language can the children identify that the poem is about days and colours? What colour do they think that Sunday must be? Take suggestions and reasons why. "C'est la joie des enfants"
goes at the beginning or the end of the poem? (Suggest that the poem rhymes so that this will help the children to decide where the line should go). Which children guessed the correct colour for Sunday? Send them on a similar hunt for "ou" and for "an"
Can the class help you to read the poem out building to a happy crescendo on a Sunday because this is "la joie des enfants!"